Here is something a little different than normal for us here at Country’s Chatter. It’s not about a new song, or a new tour, or a new artist .. it’s about a new product. But, the reason for the product is definitely something we can get behind. Kid Rock is working hard to support “Made in America” items. And, he is giving us his new Made in America Grill. He isn’t calling it that – he is calling it the American Badass Grill. While that isn’t the name I would have chosen for it, I suppose I can live with it. Check out the press release below, and head over to YouTube to see what Kid Rock does with foreign competition. (“if it’s not made in America, you don’t want it” video). [Press Release] Throughout his legendary music career, Kid Rock has never shied away from being the hard-working, in-your-face, embodiment of a true “American Badass.” Now, once again, he’s showing his true colors with the introduction of the “American Badass Grill,” a charcoal grill 100% Made in the USA. The musician says he knows it’s not always easy to do, but it’s something he feels quite strongly about. “I’m not gonna lie. It is more expensive to make things in America. But it’s important to me. I love America, and I want to do all I can to create manufacturing jobs at home,” says Kid Rock. 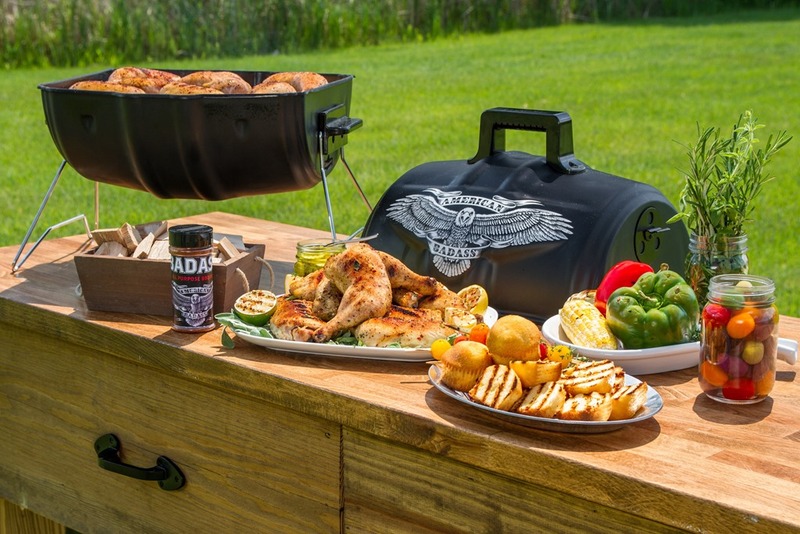 The “American Badass Grill” is American quality, tough enough to last season after season, compact enough to take on the road, yet large enough to get the job done right. It’s the perfect grill for the back yard or the bed of your truck, wherever you want to grill with a little attitude. 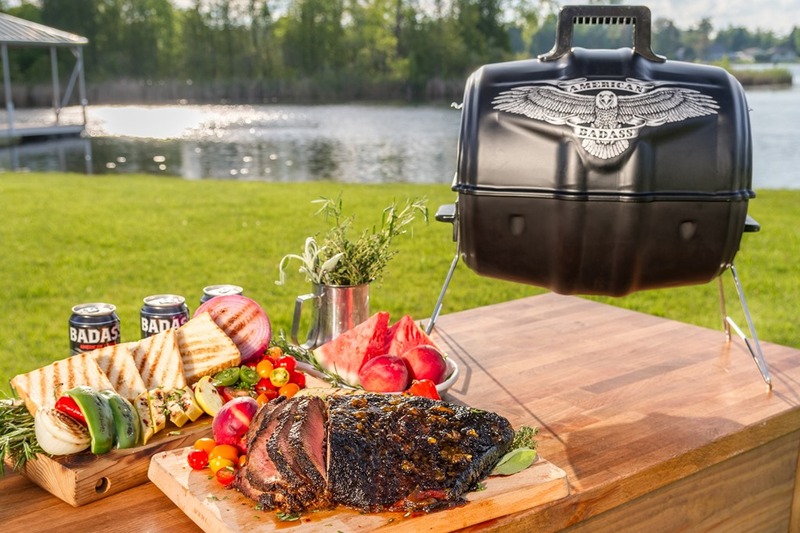 The American Badass Grill is an affordable and portable grill that can feed the whole crew. Its dual-damper system and natural convection environment give you total control to grill high and hot or low and slow – just like larger professional units. The 200 square inches of grilling space can hold up to twelve burgers all at once – or three beer can chickens. 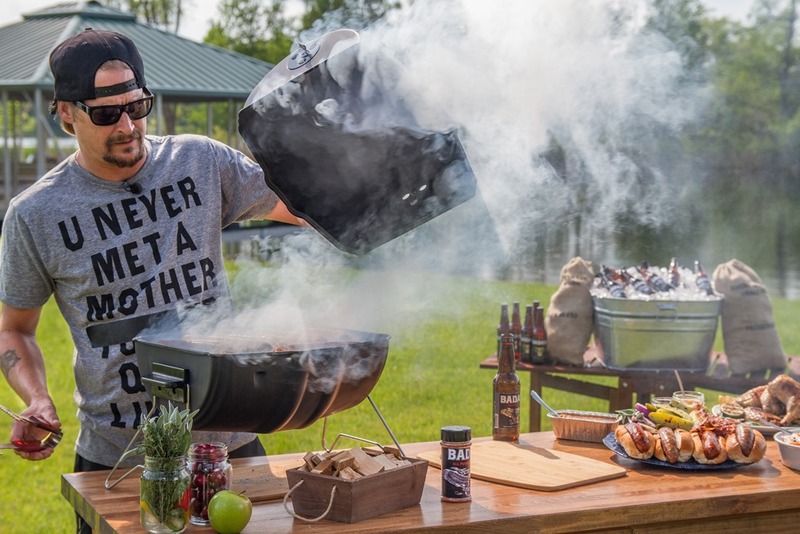 When Kid Rock came up with the name, it wasn’t just lip service or riding the glory of his genre-bending hit single, the grill is truly a tribute to America. Whether brewing his American Badass Lager in Detroit, making Made In Detroit apparel, or entertaining American troops, Kid Rock is a man who believes in America and creating opportunities for people and communities wherever he can. The American Badass Grill is yet another example of the musician shining the spotlight on the spirit that makes this country what it is.